Drove back to Columbia last Saturday after another tearful goodbye. My brother rode with me to keep me sane. It was dark by the time we pulled into town and still dark when I said goodbye to him at the airport the next morning. The darkness somehow exacerbated by sadness, and I was a mess until I got to church and remembered why I had loved this city. "I'm so happy you're back!" were literally the first words that greeted me when I walked in the door. And then I got a hug, and, oh, I could've just crumbled into it. 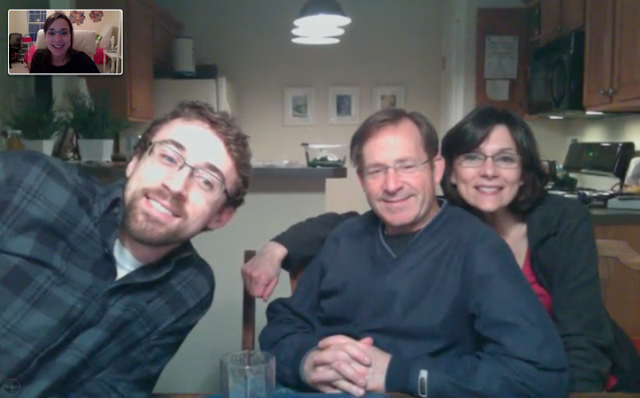 Skyping with (most of) the fam on my first day back in Como. The back-and-forth-ness of graduate school has done such a number on my heart. Being away from my family and Kentucky friends weighs on me so heavily, and so much of me just wants this semester to fly by. But I know that when it comes time to leave my Missouri friends in May, I will be an absolute wreck — a giant tear duct in human form. Classes are over, so this semester I'll be occupied with my professional project (which is like a big internship, but we're not supposed to call it an internship) + my assistantship + my master's research. I would be excited if I weren't so anxious. I love my professional project so far. It's really the prospect of doing my research on top of it that sounds impossible. Let's not talk about it. Speaking of not talking about it, my roommate, Bekah and I are taking Sundays off this semester. Shocker, right? I read this book over Christmas break, and it made me want to cry. Not because it is sad — it isn't — but because it reminded me of how tired I am and have been throughout my entire college and grad school career. The main reason I dreaded this semester was that I was so beyond worn out and beaten down last semester. I just couldn't do it any more. So, despite my uncertainty about how all my work will get done in the next few months, I've decided that none of it will get done on Sundays. Oh, and I bought a "luxury sleep mask" at Walmart for $4. It is hot pink — fuzzy on one side and satiny on the other. It makes me feel very restful. And luxurious, duh. Speaking of books, I have a problem, y'all. I have a problem with starting books before I finished my last one and then not finishing them. My bedside table is now host to nine books that I'm "in the middle of." A few of them are even from interlibrary loan, which means I went out of my way made a librarian go out of her (his?) way to get them for me. Maybe thinking I can finish non-school-related books in grad school is setting my hopes too high. In the same way that I am the type of person to start a book and never finish it, I am the type of person who pins a lot of things to Pinterest and then never makes said things. But I saw this green monster smoothie pin last Tuesday, and I went out later that day to get the ingredients. I have made it three times since. I have a feeling it is going to be my new go-to meal. It feels indulgent, but it's oh-so-easy to make and oh-so-good* for you. The perfect combination! Speaking of things that are good for you but also wonderful, I have been running more and more lately! Er ... I wrote that sentence last week when I was all excited to tell y'all how much better my legs have been doing. Today I sat back down to work on the blog post I left unfinished, and that sentence is mocking me. My left knee has been hurting again. Aching hips are keeping me awake at night. Before this week, I was running great, and now I'm in pain again and trying not to be discouraged. Here's to hoping this setback won't last long. I'd had at least two months of doing really well before this. Boo, you know? BOO AT PAIN. Apparently retailers think that people have already given up on their new year's resolutions, so they have discounted workout wear. 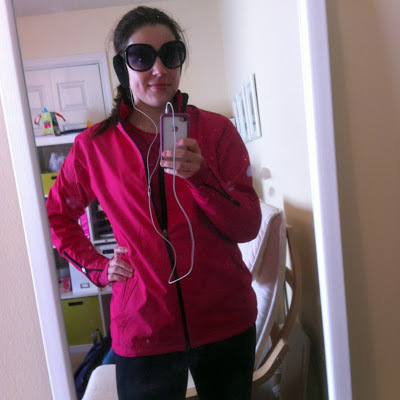 Snatched up this cute pink running jacket for TEN DOLLA NO HOLLA last week. Talk about a score. Pictured right before I hit the pavement in 19-degree weather. I told you I love running. So much good stuff going on in pop culture lately, you guys. I have thoroughly enjoyed the return of Downton Abbey and The Bachelor, and I want to see Les Miserables approximately a thousand more times. In related news, I want to marry a barricade boy. They're just so studious and masculine. I know Les Mis isn't primarily a love story, but the scene in which Jean Valjean basically passes the torch of protecting Cosette on to Marius made me swoon and long for times past. You know, times in which men were men and women were women. Speaking of men and women being men and women, this article, "The End of Courtship" that ran in the NYT recently was totally singing my life with its words and killing me softly with its song. "Traditional courtship — picking up the telephone and asking someone on a date — required courage, strategic planning and a considerable investment of ego (by telephone, rejection stings). Not so with texting, e-mail, Twitter or other forms of 'asynchronous communication,' as techies call it. In the context of dating, it removes much of the need for charm; it’s more like dropping a line in the water and hoping for a nibble. 'I’ve seen men put more effort into finding a movie to watch on Netflix Instant than composing a coherent message to ask a woman out,' said Anna Goldfarb, 34, an author and blogger in Moorestown, N.J."
I thought this was a problem unique to Christian culture, but apparently I was wrong. Read the article, marvel at its accuracy, and weep for our future. Look whose blog hit 50,000 views this week! Little old me. Thanks, everyone! Thanks for reading and putting up with the fact that I began four paragraphs in this post with the words "speaking of." You are all the best.